While Republic Diesel’s specialty is repairing components using the thermal coatings discussed in the spray metalizing section, our general machine department is capable of repairing or making new several types of components. Our shop lathes can swing parts 60 inches in diameter or slightly more than 14 feet in length. Our CNC horizontal boring mill has a 55”x60” rotary table that can travel 98″x70″x47″x19”. Our shop is equipped with several lathes, surface, mills, surface grinder and drill presses. We have our critical measuring tools calibrated to assure the best quality product possible. 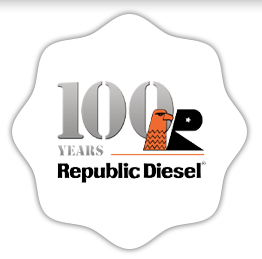 Republic Diesel has been using the Thermal Coating process to repair engine components, transmission, torque and brake components for several years. This repair process is authorized by many manufacturers to repair various components. The two primary processes we use are the thermal spray arc system and the powder flame spray process. We successfully repair components that range from a couple of inches in diameter up to 60 inches in diameter. We have applied the thermal coating to spindles and hubs in large earth moving equipment as well as repairing a seal surface of a bearing race diameter on small splined shafts. Whether you have blown a head gasket and want to check the head before reinstalling or want to totally rebuild the head to O.E.M. specs we have you covered! We also offer an extensive line of rebuilt heads ready to go!